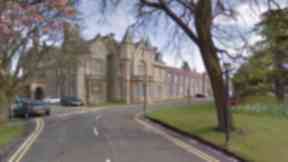 Stirling Council ignored warnings and sent office staff into unsafe boiler room. Stirling Council put its employees at risk for nine years by ignoring warnings of dangerous asbestos at its headquarters. Office staff were sent to sweep, dust and move old furniture in a boiler room where pipes were lagged with the potentially deadly material despite consultants issuing warnings three times about the danger. The workers, described as "office services assistants", were not provided with protective clothing or masks, and there was a risk they could develop asbestos-related illnesses in later life, Stirling Sheriff Court heard. Prosecutor Selena Brown said the boiler room, in the basement of Stirling Council's headquarters known as Old Viewforth, was inspected in 2003 by experts from the Institute of Occupational Medicine. They warned asbestos was present in several areas of the 1935 building. In particular, they gave the boiler room a "high material risk score" and recommended the asbestos be removed as soon as possible and the affected areas cleaned and decontaminated. No action was taken and no warnings issued to employees, including the office services assistants who had to enter the boiler room frequently through a door next to the main public reception desk. In 2010, a re-survey found the asbestos was still in place and identified the lagging on one pipe as a "high priority risk" with an associated high potential from flying fibres. Another survey in November 2011 repeated the warnings but still nothing was done. Then, on February 7, 2012, office services assistants were sent unprotected into the boiler room to give it a "deep clean". Mrs Brown said: "Three employees of Stirling Council were tasked with cleaning, dusting and tidying up the boiler room. "This involved the removal of some old furniture and water-damaged boxes. They were provided with overalls, brooms and brushes, overalls and dustpans." Mrs Brown said they were given no warnings about the presence of asbestos and how to minimise the danger from any asbestos, and no masks or proper protective clothing. Eventually, in the early summer of 2012, following another expert survey that yet again warned about the asbestos in the boiler room, the council's health and safety department realised employees might have been exposed. The council then restricted access to the boiler room and reported itself to the Health and Safety Executive, which launched an investigation. Experts called in to assess the risk to the workers concluded there was "quite limited" danger to people who had just walked through the boiler room. But "dry brushing" could have cause asbestos fibre levels in the area to peak at levels in excess of workplace limits, they found. Mrs Brown said none of the employees had yet displayed ill-effects and the asbestos had now been removed by a licensed contractor. She added: "There remains the risk that the employees may have been exposed to asbestos fibres in the course of their normal duties, and at some time in the future they could develop symptoms consistent with asbestos exposure." Stirling Council pleaded guilty to continuously breaching the Health and Safety at Work Act over a period between February 13, 2003, and May 31, 2012. The council's solicitor, Lesley Allan, said the authority could not explain what had gone wrong. She said: "It's difficult to determine why the information in the (2003) Institute of Occupational Medicine report came not to be fully acted on when it should have been." Sheriff Christopher Shead said the presence of asbestos in the building should have raised concerns that ought to have been obvious to anyone. He questioned why it had taken so long for the case to come to court and said his powers were restricted by the fact the case had been prosecuted on summary complaint, where the maximum penalty is a £20,000 fine, instead of on indictment, where the potential fine would have been unlimited. Mr Shead fined the council £10,500, reduced because it had pleaded guilty at the first court date. After the case, one Stirling Council employee, who asked not to be named because she said she feared her job might be at risk from speaking out, said: "The best way to describe this is an omnishambles. It's horrendous. "The jannies were down that cellar all the time and so were lots of other staff. "Now they've got to live the rest of their lives with the worry that every cough might be the start of asbestos cancer, while some of the guys who sat on this report for years and did nothing have swanned off into well-paid retirement. It's a scandal." A Stirling Council spokeswoman said on Friday: "The health and well-being of all our employees is our top priority. "Following the discovery of potential asbestos exposure and the service of Improvement Notices in 2012, the council responded quickly and professionally, cooperating fully with the HSE investigation and putting in place measures to mitigate the risk to employees. "The council had the asbestos removed by a licensed asbestos contractor. Over 100 members of staff who were responsible for the day to day running of council buildings were trained on Asbestos Awareness. "Other measures, including further staff training, were also put in place to manage any potential risk. The council has offered support to all staff potentially affected by this matter."